On our first visit - just last night - we saw the mother and father eagle feeding their baby eaglet. First, the father eagle arrived to the nest with 3 small fish. The mama eagle then ripped off small strands of fish - using her feet to hold the fish, and her beak. She then dangled each strand of fish from her beak over the baby's beak. It was hard to remember this was happening live.... not as an edited educational video. It was wonderful to watch this without commentary and without editing, as would be found in a documentary. 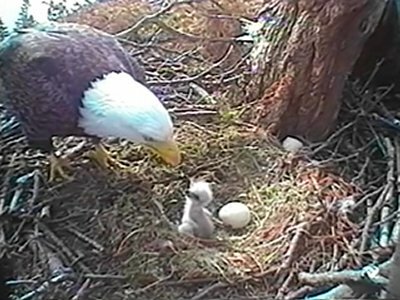 The baby eagle was born (hatched) on Thursday morning (April 29th), and it IS adorable! You will ohh and ahhh over it right along with your daughter. There is a second, unhatched egg in the nest. Observers this morning noted some activity with that egg, so there may be a second baby eagle soon. The nest is on the West Coast of British Columbia, Canada. This means, if you are on Eastern or Central time, the nest will be dark before school (which greatly disapointed my horse lover this morning - she burst out of bed wanting to see the eagles!) Still, I know they will enjoy checking in on them after school and before bedtime. We caught the feeding yesterday starting around 9:18 Eastern time. I do not know how much of a pattern the eagles follow. Please check it out, and share it with your children, and all the animal lovers you know. Let me know how you like it!